Each year I record the first time I mow our yard. This is the first time that the yard has turned white the next day. There appears to be some serious frozen white fungus on the grass. I am hoping a little sunshine might fix the problem. 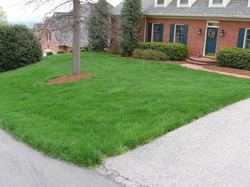 The first mowing in Roanoke is pretty consistently the last week in March. The challenge this year was that we were away for that week. As anyone who mows a yard in this area will tell you, the spring grass isn't very respectful of your travel schedule. Early spring growth here can be impressive. 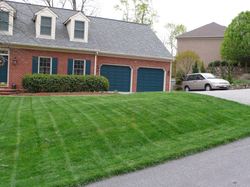 Often the yards need mowing every four or five days. While we were away, the yard got fertilized, it rained, and then it got very warm. It was all the yard needed to produce a bumper crop of grass. In fact the yard looked like it would make a pretty good pasture or hayfield when we got back on Thursday. It was actually pretty close to being beyond the capabilities of my faithful Toro mower which I pictured in my March 2005 first mowing post. Since my grass had gotten so long, I had to remove the mulching door and put on the grass chute so the cut grass could blow out to the side. Even then I had to go so slow that instead of the normal forty-five minutes, it took me nearly three hours to mow, rake, bag the grass, trim, and blow the leftovers away. It was a major effort to turn my hayfield into a well groomed yard. I actually ended up mowing the yard a second time after I had raked the grassy haze off of it. Still it looked great when I was done. 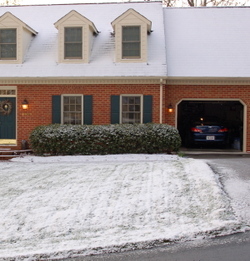 It was a little unusual this morning seeing snow and smelling freshly mowed grass. On the farm in Canada, we used to call a late season snow the "poor man's fertilizer." Based on the way our grass is growing, I do not think we need any kind of fertilizer. My over the hill lawn mowing buddy, Randy got his yard mowed at the right times and didn't have to do a double mowing like me. Of course no one expected to wake up to snow this morning. It did make for a great snowy sunrise. 2019 update- It is surprising how the weather can surprise you. I still remember my mother taking me fishing the first week in April back in the early sixties when we lived in Lewisville, NC. I caught a bunch of bluegills but it snowed. Here we are on April 2, 2019 and it is snowing in Charlotte, NC and quite possibly northern SC. That is pretty strange, but fortunately here on North Carolina's Crystal Coast we are only getting rain.